Oliver's pedigree is full of SG's, SGCH's, CH's, & Total Performer Does, w LA's90+ His dam is SGCH, EEEE91, Elite 99% PE, 7# Milk Test High, 1380# as 2nd F.
Be Mine is out of SG, Elite Redemption VVEEE90, ADGA/AGS Top 10, Breed Leader 3x, Record setting, 1380#, 8.1# high. Cassie is our next Oliver daughter and is 1/2 sister to SG, Elite Comet 2*M 2*DAR, 1211# as FF. 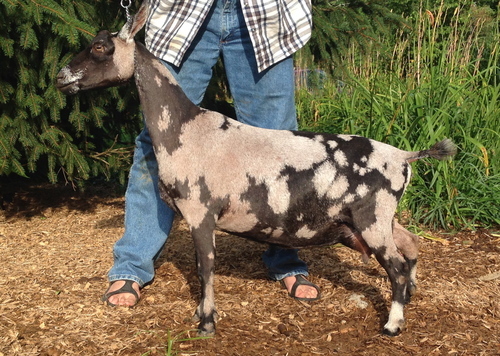 Grace is out of SG, Elite Redemption VVEEE90, ADGA/AGS Top 10, Breed Leader 3x, Record setting, 1380#, 8.1# high. Addie is out of SG Allamanda EEEE91, ADGA/AGS Top 10, 1000# milker.